Today we will talk about how to grow carrots. This is the third edition of the easiest growing crops series. Today’s focus is carrots. You can also check the prior two crops Tomato and Cucumber by clicking the links. Carrots are actually tap-root which have enlarged. They have a very wide and deep root system. Carrot is a cool climate crop, so you should always sow carrots in the winter, especially in the sub-tropical areas. 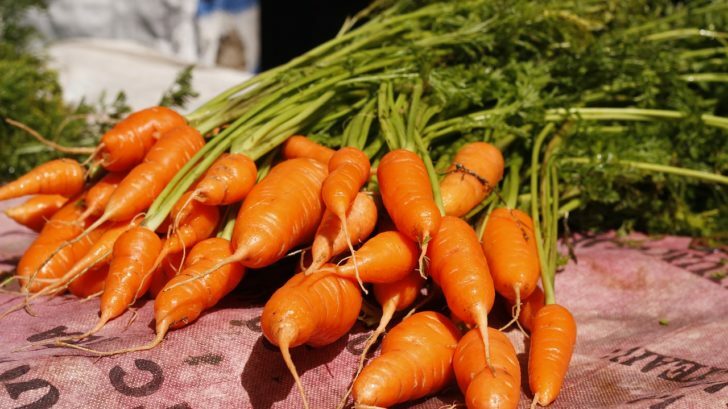 The optimum temperature for growing carrots is 60 to 70 deg F.
Though we are used to experiencing carrots as orange in color, there are other varieties which can be white, crimson or even purple in color. But rather than focusing on color your main concern should be on the root size to suit your soil. Carrots prefer fertile, well-drained, deep, sandy soils rich in organic matter for best growth. Most of the light soil is well suited for growing carrots. If you have heavy soil add some compost with the soil to make it lighter. you can also add coir. Use the uniform blend of soil, it should be without any lumps and stones. Presence of lumps or stones can cause the roots to fork. The depth of the soil should be at least twice that of the mature size of the carrot. The ideal pH of the soil should be between 5.5 to 7.0. Put a sufficient amount of compost or rotting organic matter. Carrots need nutrient-enriched soil. Adding nitrogen can be very crucial to the growth and aesthetics of your carrots. Organic sources such as blood, alfalfa meal, horn-meal, etc., can be used. Also, think about using companion planting and crop rotation techniques. Growing carrots after legumes can eliminate the need for adding extra nitrogen. Avoid hot nitrogen sources like fresh manure and fish fertilizer. They can cause roots to fork. we grow carrots from seeds. Plant them 1⁄4-1⁄2 inch deep in the soil in rows. Once they grow a little bit (3-4 true leaves comes out) do a little thinning. Keep a gap of 3-4 inches between plants and 12-18 inches among rows. Carrots also do well with most plants. Rosemary and sage can deter carrot flies. Check companion planting for more details. 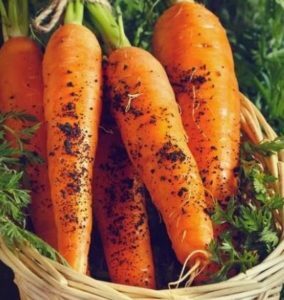 If you are planning to grow the carrots till it gives you seed, it is necessary that you avoid planting Dill, Coriander or other plants of the Umbelliferae family. These plants cause cross-pollination and thus chances of getting the seeds are greatly reduced. Though if you have only planted for the roots and not concerned about getting the seeds, this might not much of an importance to you. Here is good news for urban gardeners, you can grow carrots in the containers too. Just choose the pot which is at least 12 inches deep (container should be twice as deep as the size of the mature carrot) and with good drainage facility. In case you need more information about container gardening information about container gardening checks out my earlier blog. In this case, try to plant the seeds 1 to 3 inches apart. Cover the seeds with soil and water often (More on watering techniques here). It is always better to try for the smaller varieties. It generally takes 12 to 15 days for seeds to germinate. Once they have emerged, cover them with a fine mesh netting. It will help to get air, water, and sunlight, but keeps pest at bay. Applying mulch can keep the moisture level and also reduce the weed problem. The growth of the carrot seedling is always slower than the weeds. You can prevent nematodes from harming the plant by applying plenty of compost. These are rich in predatory microorganisms and can prey on nematodes. Carrots can be harvested in less than three months for most of the varieties. You can judge the size of the carrot by looking at the top. Usually, the largest carrots have the darkest and greenest top. Most are at their prime when about 2.5 cm in diameter at the crown. It is crucial that you don’t leave your carrots for too long on the ground. It can make them too long, tough and sometimes distasteful. Do some watering before harvesting. It will soften the soil and will be easier to take out the carrot. Cut off the leaves as soon as they are out with some sharp knife. Do not just break the top as it tends to sprout and will shorten their storage life. Leaving them for too long on the ground can attract the carrot fly. Gently wash them with cold water to remove all the dirt and it will also cool them down. If you follow these above-mentioned processes, You will be pleasantly surprised by the flavor of home-grown carrots. They have a flavor that many modern mass market carrots seem to have lost.